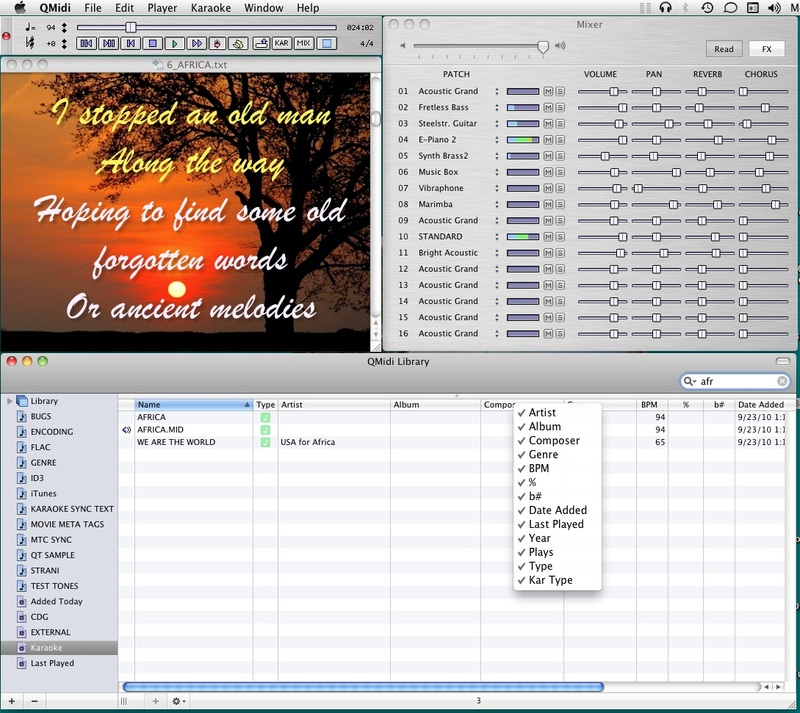 QMidi is a MIDI/Karaoke player for the Macintosh. It can organize and play many types of media files, including movies and CD+G, and allows easy text and chords editing/synchronization. It features real time pitch shifting, time stretching and the ability to display karaoke and movie content in full screen mode, even on a second monitor. Added support for UTF-8 encoded MIDI files. Added Reed-Solomon error correction on CDG files. Some CDG commands were not handled correctly. Fixed. Since version 2.5, exporting a MIDI karaoke file as movie did not work correctly. Fixed. Posted by zman on Sun, 01/11/2015 - 16:19. "QMidi can't be opened because the identity of the developer cannot be confirmed." Posted by ThelmaCantu33 on Mon, 10/18/2010 - 03:52. Some time before, I did need to buy a building for my firm but I did not have enough money and could not order something. Thank heaven my comrade suggested to try to take the home loans at reliable creditors. Therefore, I acted so and was happy with my short term loan. Posted by Mark on Fri, 04/02/2010 - 19:58. I use Qmidi since a few weeks and it works fine, but it doesn´t show chords. I tried to play some proffessionell midisongs with lyrics and chords (I see it on my Yamaha Tyros display) but it just shows the lyrics on Qmidi. Also I dont know, how to put chords in for my own songs. Posted by Anonymous on Thu, 07/23/2009 - 04:24. I'm trying out qmidi but can't find where you play, sing, and record to an MP3. Convert my karaoke into a video file ? Posted by estuardo on Wed, 01/07/2009 - 19:05. How can I convert my karaoke into a video file ? Posted by Len on Fri, 05/11/2007 - 12:42. There is a pitch transposer. Posted by Anonymous on Sun, 01/17/2010 - 01:02. Posted by Frank Freeman on Sat, 07/02/2011 - 00:25. You have it in Quicktime player. It can change pitch up or down and slow or speed up the music. Posted by Tim again on Fri, 07/14/2006 - 19:44. I've been using Qmidi for 6 years now!! Again, it's a very versatile program, totally stable, plays all sorts of files and now in the OSX version is a karaoke CREATOR program too. I have only one small complaint-suggestion. You can't alter the font size of the play list (karaoke yes, playlist no). As I get older and blinder it's getting to be a problem!!! Posted by puncums on Thu, 11/11/2004 - 04:40. Posted by roberto on Sun, 02/06/2005 - 12:16. Posted by luca on Wed, 06/06/2007 - 11:04. Posted by TIM on Thu, 03/04/2004 - 01:13. Posted by Robert Olin on Mon, 07/08/2002 - 05:22. Posted by Robert Olin on Mon, 07/08/2002 - 05:21. Posted by Rigel Jose Sanchez on Tue, 06/15/2004 - 19:45. Posted by jorge valera on Wed, 07/12/2006 - 23:02. Posted by Brad on Mon, 04/01/2002 - 15:20. Has anyone used Qmidi with the Mac OSX? I'm using it with a Midisport 2X2. I can't seem to get the Mac to read the Midisport correctly. In Qmidi/midisettings it says port a and port b but it doesn't read the midi interface. Any suggestions? Posted by gustavo on Wed, 05/07/2008 - 17:58.
: Has anyone used Qmidi with the Mac OSX? I'm using it with a Midisport 2X2. I can't seem to get the Mac to read the Midisport correctly. In Qmidi/midisettings it says port a and port b but it doesn't read the midi interface. Any suggestions? Posted by fghhgjklk on Mon, 06/03/2002 - 19:04. Posted by TIM on Sun, 03/28/2004 - 05:48. I recently used Qmidi 1.6 with the Midisport 1x1 and it worked well - showed up in the midi pref. page as the USB port. Posted by John De Muri on Mon, 12/25/2000 - 18:12. Posted by TIM on Tue, 05/23/2000 - 15:06. I've now been using Qmidi for over a month + I love it. Another nice feature I've discovered. If you have multiple playlist open, (eg) set 1, set 2, Irish songs, heavy rock.........You can tab from box to box to box. Handy! I run it on a Mac Powerbook 145 b/w and it works great! No problem mixing mid and kar files into 1 list - it plays 'em all. Posted by Email Marketing on Tue, 06/22/2004 - 18:23. Whole sale email advertising at http://www.listbanx.com/package.htm . bulletproof implementation, and cutting-edge analysis technology. Posted by Email Marketing on Tue, 06/22/2004 - 17:13. Posted by Email Marketing on Tue, 06/22/2004 - 16:35. Posted by Email Marketing on Tue, 06/22/2004 - 15:40. Posted by Email Marketing on Tue, 06/22/2004 - 14:31. Posted by Tim on Thu, 04/13/2000 - 05:23. Karaoke fonts are adjustable by size and type. Uses RAM so it's instant.